GALION — Sharon Baldinger, Sue Miller and Galion Mayor Tom O’Leary stand next to a tree planted near the new Depot Pavilion. The tree was planted by Oakstone Landscaping to honor the memory of long-time City of Galion employee Mert Lenhart, who died in 2010. Lenhart retired after 30 years with the city, the last several years as an assistant superintendent of the Streets and Parks Department. He also was a big lover lover of the Christmas season, and the tree will be decorated every year at the holidays to continue a tradition started by his widow, Cathi. Erin Miller | Galion Inquirer Sharon Baldinger, Sue Miller and Galion Mayor Tom O’Leary stand next to a tree planted near the new Depot Pavilion. The tree was planted by Oakstone Landscaping to honor the memory of long-time City of Galion employee Mert Lenhart, who died in 2010. Lenhart retired after 30 years with the city, the last several years as an assistant superintendent of the Streets and Parks Department. He also was a big lover lover of the Christmas season, and the tree will be decorated every year at the holidays to continue a tradition started by his widow, Cathi. 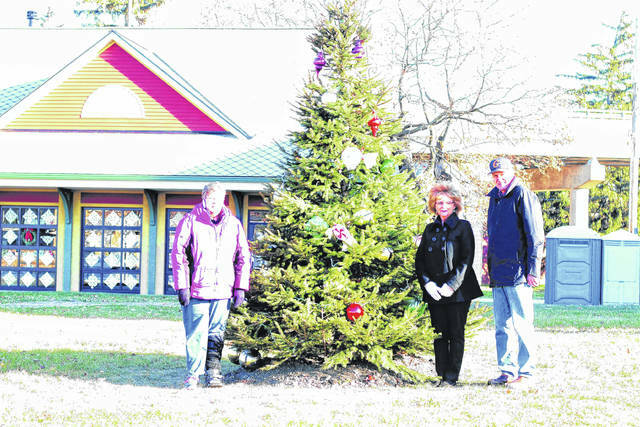 https://www.galioninquirer.com/wp-content/uploads/sites/38/2017/12/web1_IMG_6550.jpgErin Miller | Galion Inquirer Sharon Baldinger, Sue Miller and Galion Mayor Tom O’Leary stand next to a tree planted near the new Depot Pavilion. The tree was planted by Oakstone Landscaping to honor the memory of long-time City of Galion employee Mert Lenhart, who died in 2010. Lenhart retired after 30 years with the city, the last several years as an assistant superintendent of the Streets and Parks Department. He also was a big lover lover of the Christmas season, and the tree will be decorated every year at the holidays to continue a tradition started by his widow, Cathi.